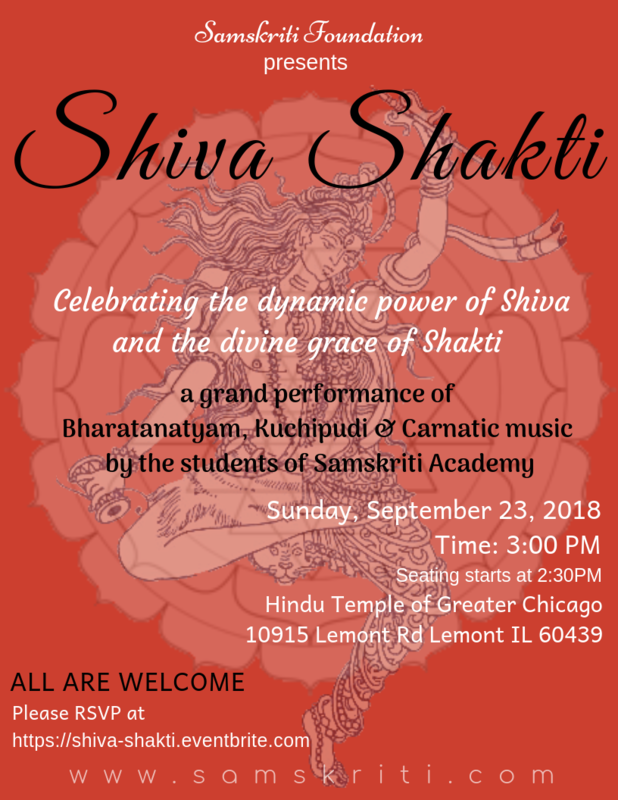 Samskriti Foundation presented 'Shiva Shakti' a scintillating performance depicting the dynamic power of Shiva and divine grace of Shakti through Dance & Music on September 28th 2018 at HTGC in Lemont, IL. Having been actively involved in organizing programs showcasing South Indian classical art forms in the Chicagoland area for many years, I was mesmerized by this fascinating production. Shoba Natarajan, the well-respected artistic director along with her students enthralled the audience with a skillful combination of Carnatic music and dance. Samskriti’s students of various skill-levels were highly successful in bringing together Shiva and Shakti which represent complementary aspects of creation, the masculine and feminine principle. The musical part of the performance featured a concert based on Shiva & Shakti titled ‘Shiva Shakti Swaramala.’ Shoba’s mother Mrs. Subhadra Natarajan, a highly experienced music teacher/composer and senior music faculty at the Samskriti Academy had trained almost 40 young kids to perform an impressive lineup of fifteen ‘Nottuswarams’ composed by Muthuswami Dikshitar. I was intrigued by how they had creatively incorporated a western twist to complement the Carnatic music, by using guitar, saxophone, keyboard and cello along with violin, mridangam, and tabla. It was an honor to have an opportunity to enjoy this ambitious presentation from Shoba Natarajan, a leading dance maestro from Chicago area. 'Shiva Shakti' - dance and music production that premiered on Sept 23, 2018 was a grand success. Our heartfelt gratitude to the Samskriti students who worked so hard to bring this production to life, the parents who volunteered their time and efforts, and pitched in all resources to make this event such a memorable one. Samskriti Foundation would like to also thank its patrons and well-wishers for supporting us and being a part of all our endeavors. We are happy to share some glimpses from the performance. Photography by: Kumar Venkatasubramanian.